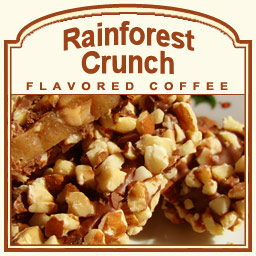 The Rainforest Crunch flavored coffee is a full-flavored treat that features nuts, vanilla, and a spicy bite. With crunchy and nutty overtones, the flavors of toasted almonds, hazelnuts, and macadamia nuts will resonate on your taste buds. Each cup only has 2 calories, but this Rainforest Crunch has deep flavors that are satisfying and will fulfill your taste buds and their nutty cravings. Packaged in a heat-sealed valve bag, the freshest coffee will be sent to you after it's roasted and shipped on the same day. Take a trip to the rainforest with this vanilla-inspired hodgepodge of nutty flavors.